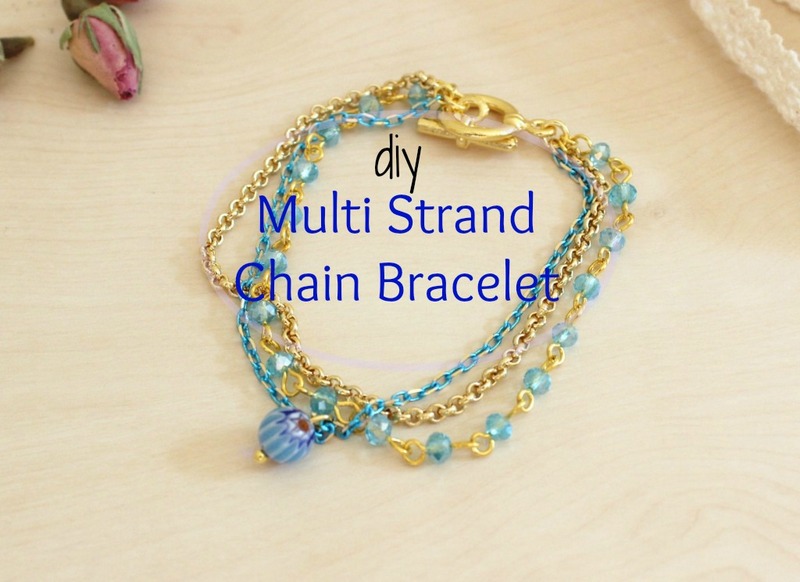 DIY Multi Strand Chain Bracelet!!! Isn’t it really annoying to create jewels and to always have these small chain scraps that are not able to use them to create a necklace but again are almost in the correct length to create a bracelet? 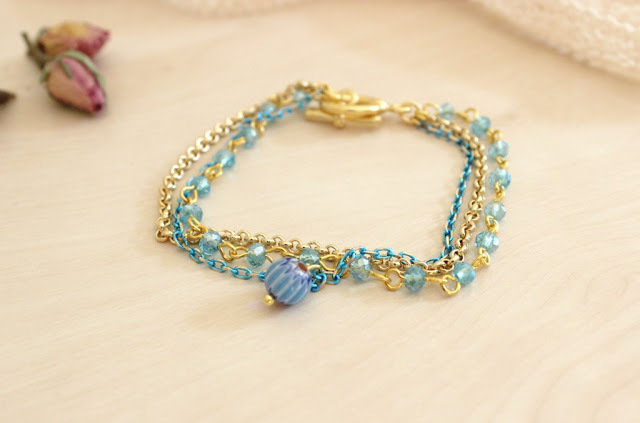 I have to admit that I have a small collection of such scraps and I just find a way to use them again for a bracelet! Let’s create it together! 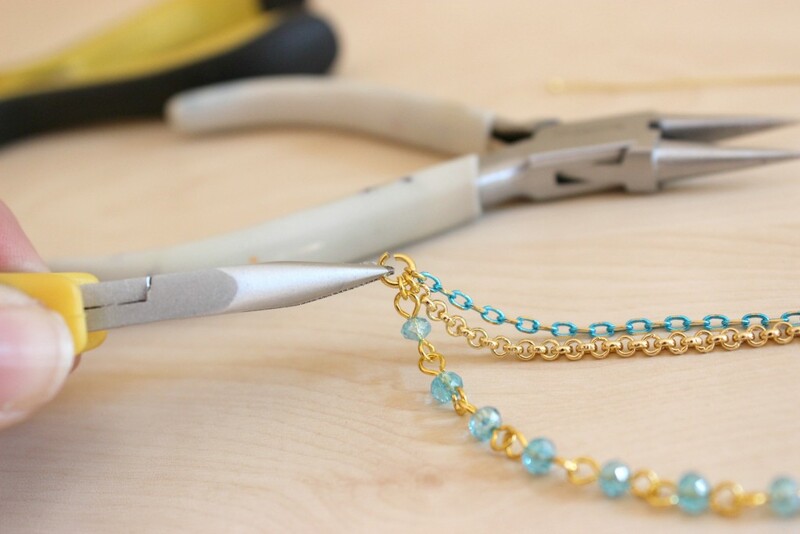 First choose what chains are you going to use. 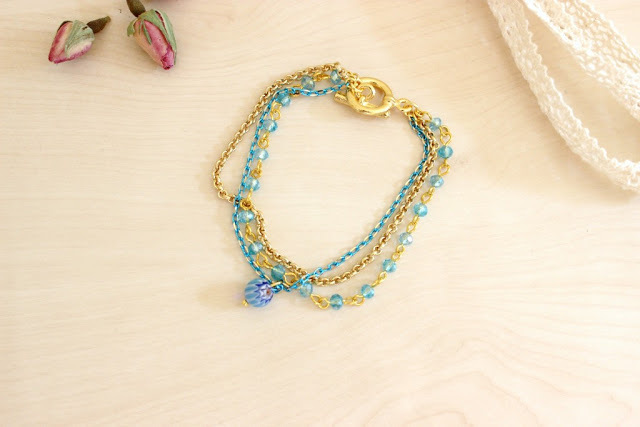 I have used a gold plated chain, a turquoise and gold chain and a handmade beaded chain, all of them in gold and blue tones, just perfect for this Summer. Cut three pieces (one from each) in the same length. 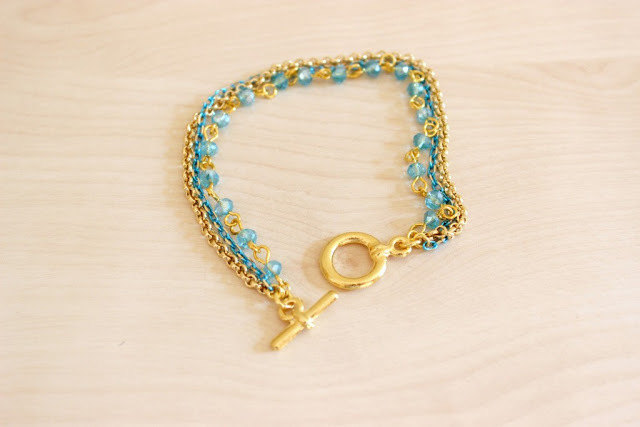 Finish the bracelet by using your favorite type of lobster (I have use a gold plated toggle clasp). If your chains are not in the proper length to create a bracelet then use more jump rings to extend it or just a big lobster, like I did. The main body of your jewel is ready. You can enjoy it as it or add a small beautiful detail! 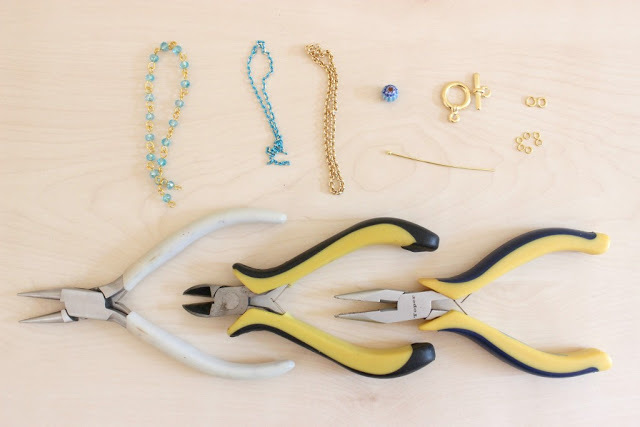 This is mandatory, but it will make your bracelet unique. 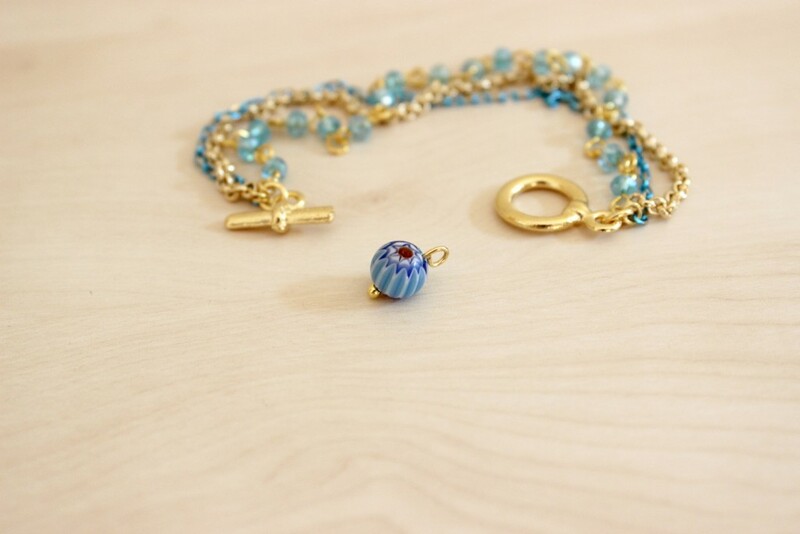 Just use a Millefiori bead or any kinf od bead or small pendant you like, pass it in the head pin and create a loop. 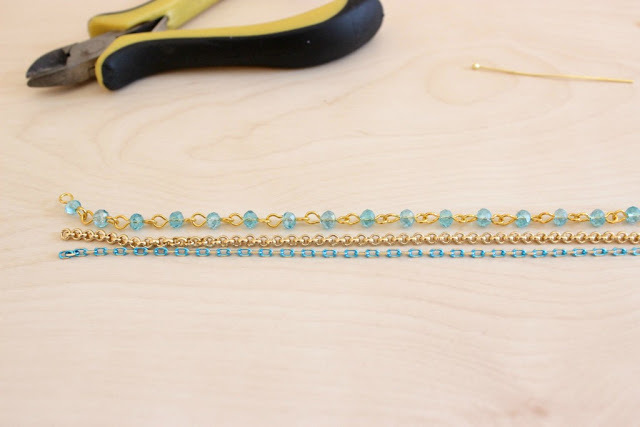 Connect it with a jump ring with one of your chains! Ready, totally a recycled project and full of blue! What do you think???? Πανέμορφο και καλοκαιρινό Ζηνα μου! Σε ευχαριστω πολύ Σωτηρία μου! ιδανικό για να συμπληρώσει το καλοκαιρινό μας λουκ! Πολύ ωραία έδεσε το ένα με το άλλο! Φιλάκια!!! Είναι τέλειο Ζήνα μου και με αγαπημένα καλοκαιρινά χρώματα!! Η χαντρούλα πράγματι του προσθέτει τσαχπινιά! Φιλάκια πολλά!! Σε ευχαριστω πολύ Θάλεια μου! Είναι τέλειο! Και φυσικά δεν πετάς τίποτα! ε ναι… για ρωτα κ τον ανδρα μου να δεις τι εχει να πει γι αυτο!